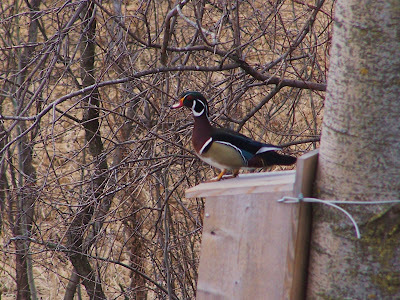 Yesterday the Woodducks came back to the back yard to check and see if their home was still attached to the tree. With the squater squirrels that took possession over the summer, the ducks have some spring cleaning to do on their home. It was really interesting to watch them. 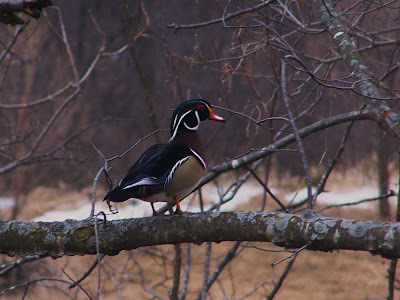 The male, who is quite beautiful, staked out a branch near the box for about a half hour. Then he would hop branches, getting a little closer each time. Finally, he landed on the box, checked it out, then called the female over to give her final approval. If this isn’t the same way couples pick a house in this market, then I don’t know what is.